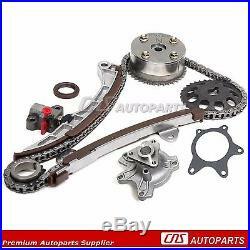 Toyota Prius Yaris Echo Scion 1.5L 1NZ-FE Timing Chain Kit+VVT-i Gear+Water Pump. 1.5L 1497cc DOHC (16 Valve), "1NZ-FE", "1NZ-FXE". 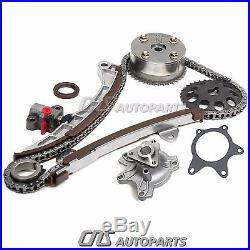 Brand New Timing Chain Kit w/ "VVT-i Adjuster" + Water Pump. 04 - 06 SCION xA 1.5L 1497CC L4 DOHC (16 Valve), "1NZ-FE". 05 - 06 SCION xB 1.5L 1497CC L4 DOHC (16 Valve), "1NZ-FE". 01/04 - 05 TOYOTA ECHO 1.5L 1497CC L4 DOHC (16 Valve), "1NZ-FE". 01/04 - 09 TOYOTA PRIUS 1.5L 1497CC L4 Electric / DOHC (16 Valve), "1NZ-FXE". 06 - 15 TOYOTA YARIS 1.5L 1497CC L4 DOHC (16 Valve), "1NZ-FE". 1 Timing Chain (124 links). 1 Guide Rail (Left-Tensioner Rail). 1 Guide Rail (Right-Fixed Rail). 1 Cam Sprocket "VVT-i Adjuster Actuator" (Intake). 1 Crank Sprocket (18T-Press fit on crank). 1 Water Pump w/ Gasket. Crank Sprocket : Before removing, mark exact tooth timing mark position, depth position on crank snout, and direction (front & back). This kit includes an Intake "VVT-i Adjuster" Cam Sprocket. THE TEAM ARE HAPPY TO HELP. &###xA0; &###xA0; &###xA0; &###xA0; &###xA0; &###xA0; &##xA0. UPS Ground Service / UPS 3 Day Select / UPS 2. &###xA0; &###xA0; &###xA0; &###xA0; &###xA0; &###xA0;&###xA0; &###xA0; &###xA0;&##xA0. &###xA0; &###xA0; &###xA0; &###xA0; &###xA0; &##xA0. &###x200B;&###x200B;&###x200B;&###x200B;&###x200B;&###x200B;&###x200B;CNS Autoparts strives to provide 5-star customer service. There are no exemptions and guarantees the quality of the components you receive. We firmly believe&###xA0;our parts are free from any defects in workmanship, material and that all manufacturing is processed under a strict quality control environment. All of our gaskets are specially made to meet or exceed OEM standards and performance requirements. We hope to continue to grow domestically and expand internationally. We will do everything we can in order to build your trust and business. PART NUMBER: TK2000-VVTWP TOYOTA / SCION 1.5L 1497cc DOHC (16 Valve), "1NZ-FE", "1NZ-FXE" Brand New Timing Chain Kit w/ "VVT-i Adjuster" + Water Pump Application 04 - 06 SCION xA 1.5L 1497CC L4 DOHC (16 Valve), "1NZ-FE" 05 - 06 SCION xB 1.5L 1497CC L4 DOHC (16 Valve), "1NZ-FE" 01/04 - 05 TOYOTA ECHO 1.5L 1497CC L4 DOHC (16 Valve), "1NZ-FE" 01/04 - 09 TOYOTA PRIUS 1.5L 1497CC L4 Electric / DOHC (16 Valve), "1NZ-FXE" 06 - 15 TOYOTA YARIS 1.5L 1497CC L4 DOHC (16 Valve), "1NZ-FE" Package includes ---1 Timing Chain (124 links) ---1 Timing Chain Tensioner ---1 Guide Rail (Left-Tensioner Rail) ---1 Guide Rail (Right-Fixed Rail) ---1 Cam Sprocket "VVT-i Adjuster Actuator" (Intake) ---1 Cam Sprocket (36T-Exhaust) ---1 Crank Sprocket (18T-Press fit on crank) ---1 Crankshaft Front Seal ---1 Water Pump w/ Gasket Special features ---Crank Sprocket : Before removing, mark exact tooth timing mark position, depth position on crank snout, and direction (front & back). --This kit includes an Intake "VVT-i Adjuster" Cam Sprocket. The item "Toyota Prius Yaris Echo Scion 1.5L 1NZ-FE Timing Chain Kit+VVT-i Gear+Water Pump" is in sale since Tuesday, November 12, 2013. This item is in the category "eBay Motors\Parts & Accessories\Car & Truck Parts\Engines & Components\Timing Components". Other Part Number: VVT-i Adjuster (Actuator) Gear Included.